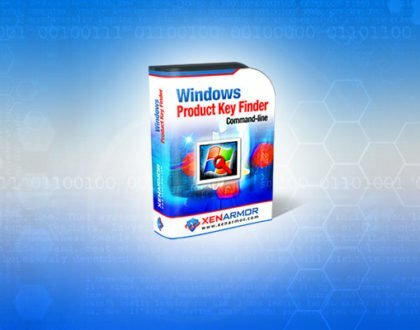 XenArmor Windows Product Key Finder is the enterprise software to help you instantly recover your lost or forgotten Windows License Keys. It can also help you find license CD Keys of 500+ popular softwares including MS Office, MS SQL Server, Adobe, Norton Anti-virus, VMWare, Winamp etc. Not only from local computer but it can also find Windows License Keys from External Disk, Registry Hive Files or Remote Computers on your network. Also it can generate automatic backup database file for every recovery operation. Recover CD Keys of 500+ popular softwares including Office 2016/2019, IE, SQL Server, Adobe, VMWare etc. Recover Keys of 100+ popular Games like FIFA, NFS, AOE, Quake, The Sims, Half-Life etc. 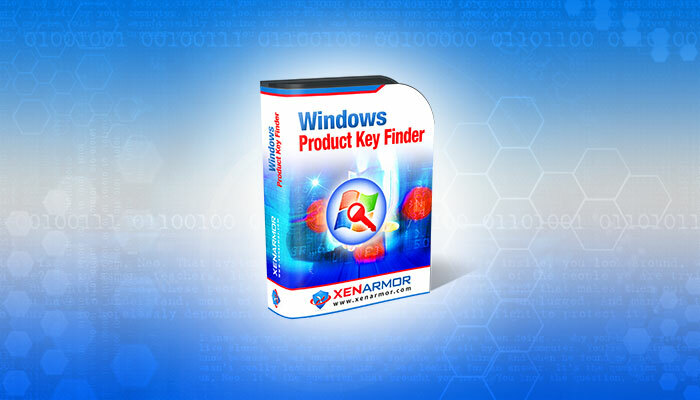 XenArmor Windows Product Key Finder works on both 32-bit & 64-bit platforms starting from Windows XP to Windows 10. Operating System: Windows XP, Vista, Windows 2008/2012/2016, Windows 7/8/10. 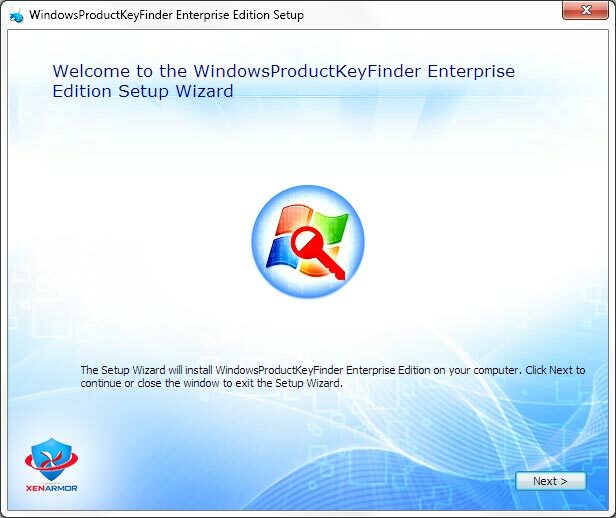 XenArmor Windows Product Key Finder comes with standard windows installer which allows seamless installation & un-installation. You can easily sort the displayed password list based on Source List, Product Name, Version, License Key etc. by simply clicking on corresponding header in the List. You can also right click on any entry in the list to quickly & easily copy various fields such as Product Name, License keys etc. During recovery operation, you can click on ‘Stop Recovery’ to abort it anytime. Also it will display detailed status of current task being performed. Finally you can recover the keys again by simply clicking on ‘Start Recovery’. 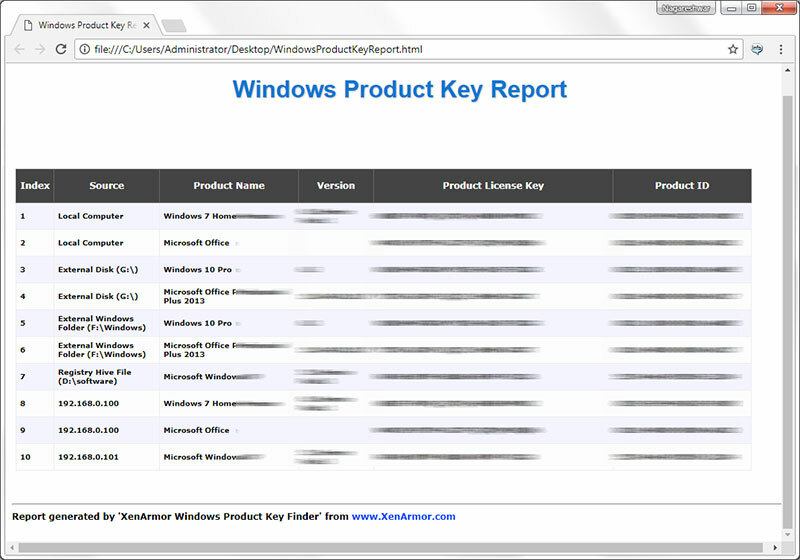 XenArmor Windows Product Key Finder helps you to generate detailed report in both HTML, CSV, XML, JSON & SQLite (new in 2019 edition) format. Once license keys are recovered, simply click on Report button and then select the Type of Report (HTML, CSV, XML, JSON or SQLite) from the ‘File Save Dialog’. Settings help you to tweak & customize Windows Product Key Recovery operations such as selecting License Keys to recover, Source List and automatic backup options. Refer to below sections for more details on each of the sections in Settings screen. First section “Find License Keys” helps you to select or deselect the products. Simply select the product for which you want to recover keys from & click on SAVE button to save the changes. Settings help you enable and customize Automatic Backup options such as Backup folder location. Once updated, click on ‘Save button’ to save the changes. By default automatic backup feature is disabled. For “Local Computer” source type, you can simply edit and click on update to enable it. To remove “Local Computer”, right click on it and click on “Clear/Remove Source”. Note that this feature is available only in Enterprise Edition. 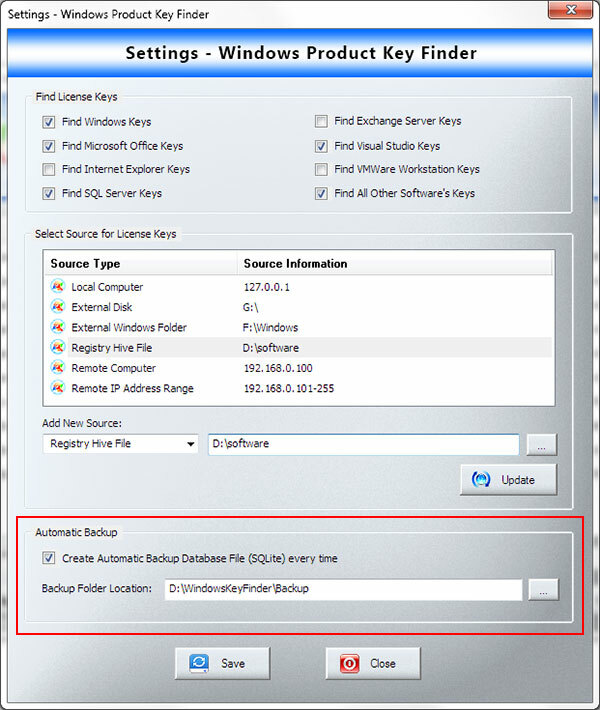 XenArmor Windows Product Key Finder creates backup files in SQLite database format. So you can use any SQLite browser tools to view it. Also you can open it directly by clicking on “Backup” button in the main application and then selecting the right Backup database file or simply drag & drop your file onto main application. 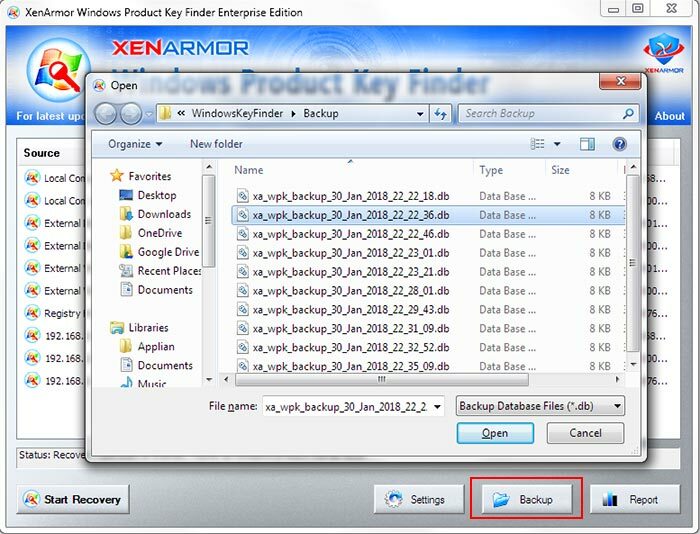 XenArmor Windows Product Key Finder helps you to not only recover from local computer but also recover from external sources such as External Disk, Windows Folder, Registry Hive file, Remote Computer etc. Here are the detailed steps for each of these methods. 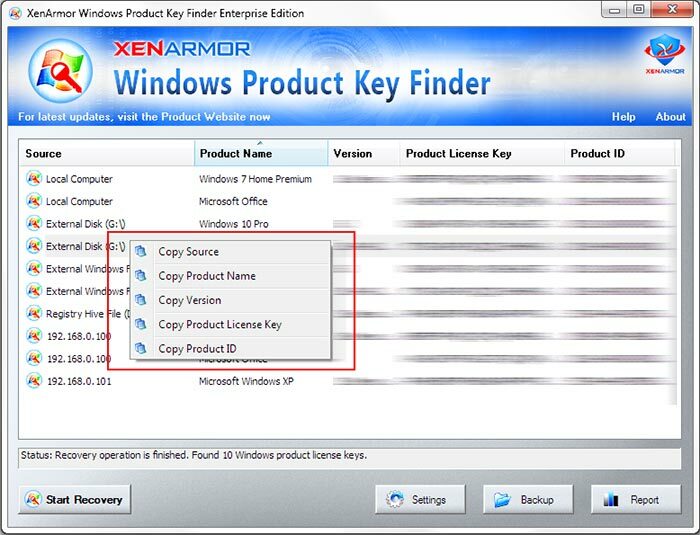 By default, XenArmor Windows Product Key Finder helps you to recover all Windows and third party license keys from Local Computer. You can enable or disable it using Settings as explained above in “Settings – Recover Keys from Multiple Sources”. 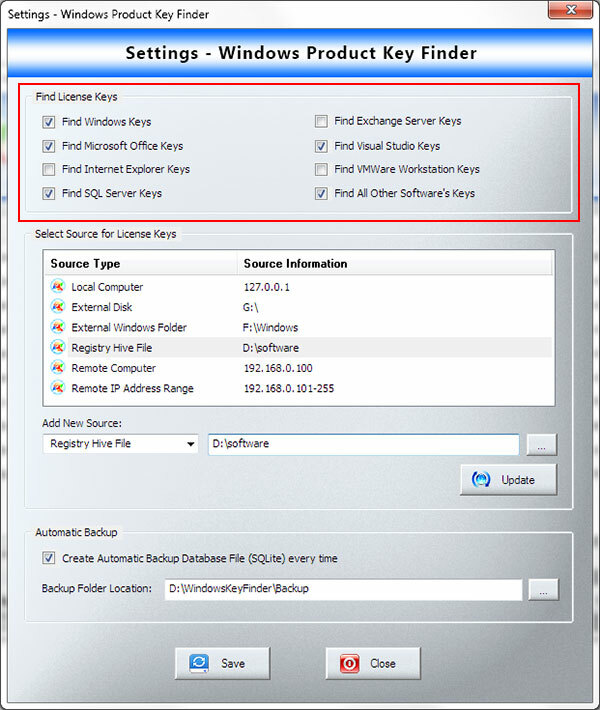 XenArmor Windows Product Key Finder helps you to recover license keys from External Disk belonging to another Computer. Also if it does not work (especially Windows 7 or higher) then run it as Administrator. 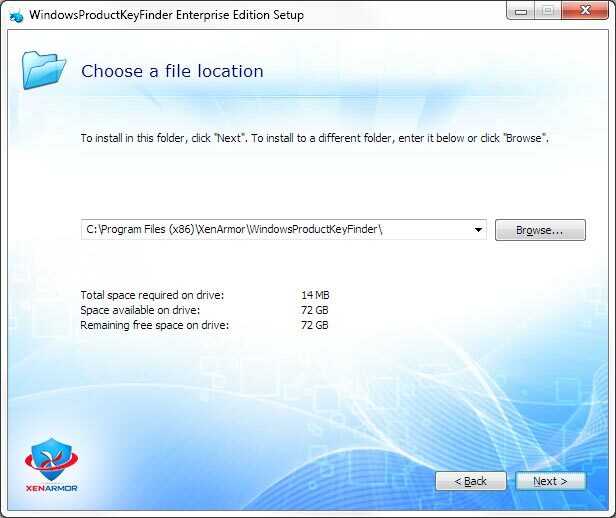 XenArmor Windows Product Key Finder helps you to recover license keys from Windows folder belonging to another operating system on the same or different computer. Also if it does notwork (especially Windows 7 or higher) then run it as Administrator. XenArmor Windows Product Key Finder helps you to recover license keys from Registry Hive File (Software) of another operating system. 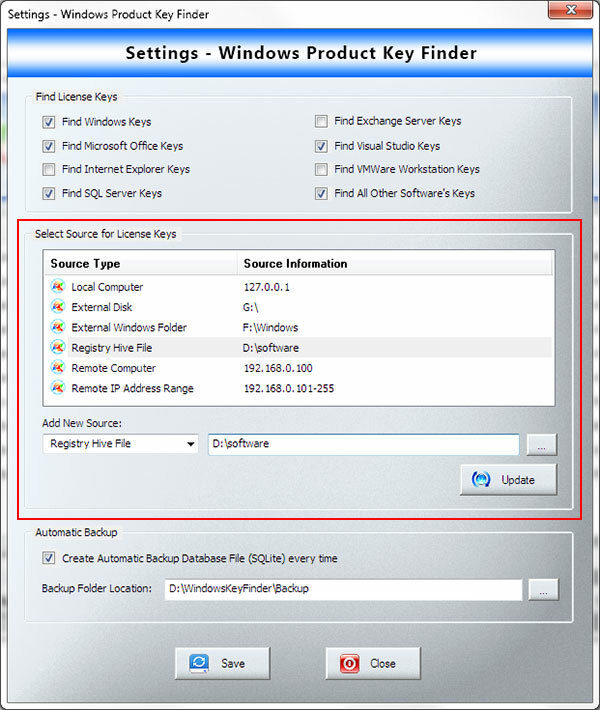 If you are confused then simply use the External Disk or Windows Folder source type (as explained in above sections) to specify the disk/folder and Windows Product Key Finder will pick the right file for you. Also if it does not recover any license keys (especially Windows 7 or higher) then run it as Administrator. 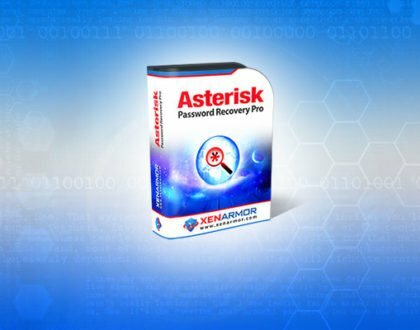 XenArmor Windows Product Key Finder helps you to recover license keys from single Remote Computer or range of Remote Computers on your Network. Important: You must have Admin access and configure the Remote Computer properly to recover license keys as explained in the next section. In order to recover license keys from any Remote Computer on your network, you must have admin access and configure it as explained below. If your network has a Domain Controller and you have admin access to this domain then some of these settings are made automatically when remote computer joins the domain. 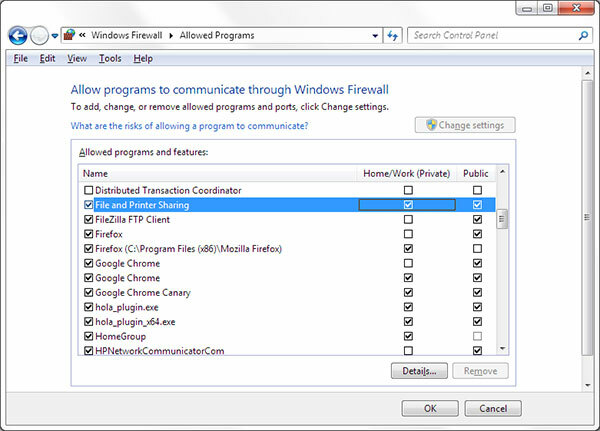 On the Remote Computer, Edit the following Registry settings to set the Network Security & Sharing mode to Classic. 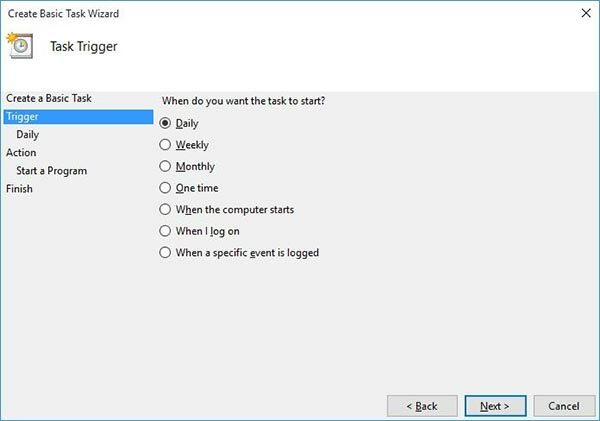 On the Remote Computer, Edit the following Registry settings to turn off Remote User Account Control in Windows Vista/Windows 7/8/10 operating systems. Remote Registry service needs to be running on remote computer to access & recover the license keys. Note that Remote Registry service is started by default in Windows XP. In some of the Windows 10 systems, you need to restart it manually every time system is restarted as it is set to Auto Trigger Start. Finally connect to remote computer from your computer. You need to connect to admin (admin$) or similar shares (c$, d$ etc) as shown below. net use \\192.168.0.101\admin$ "password" /user:"administrator"
You may have to restart the Remote Computer on completion. By default Windows Product Key Finder performs PING check to verify if Remote Computer is alive or not to speed up the operations. 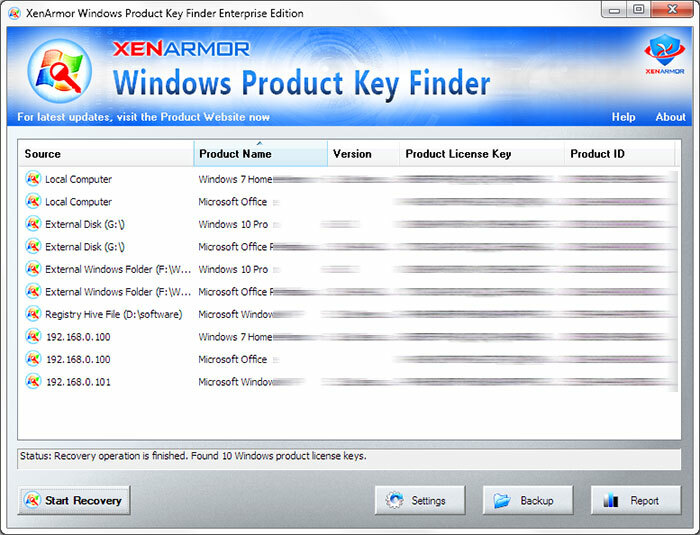 XenArmor Windows Product Key Finder supports both GUI & command-line in the single executable file. 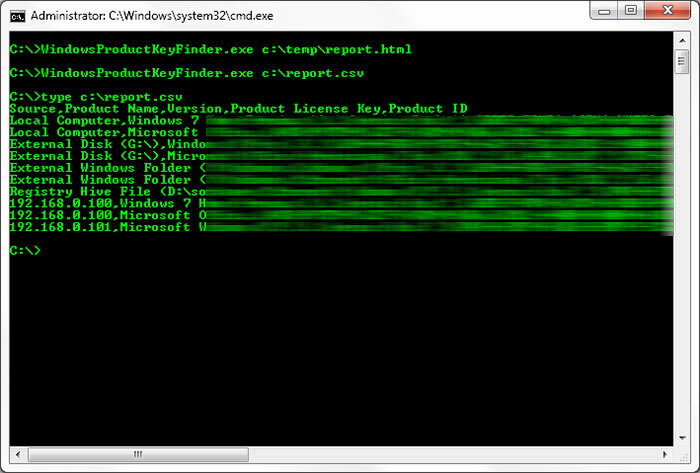 Command-line version helps you to fully automate Windows license key recovery operation. You can also easily integrate it into your scripts or programs as part of advanced operations. By default it will generate report in HTML format. You can specify csv, xml, json or db file extension o generate report in CSV, XML, JSON or SQLite format. Important: Command-line version uses the same settings configured by GUI version. So you can use Settings in GUI version to customize your license key recovery operation and then use the command-line version. 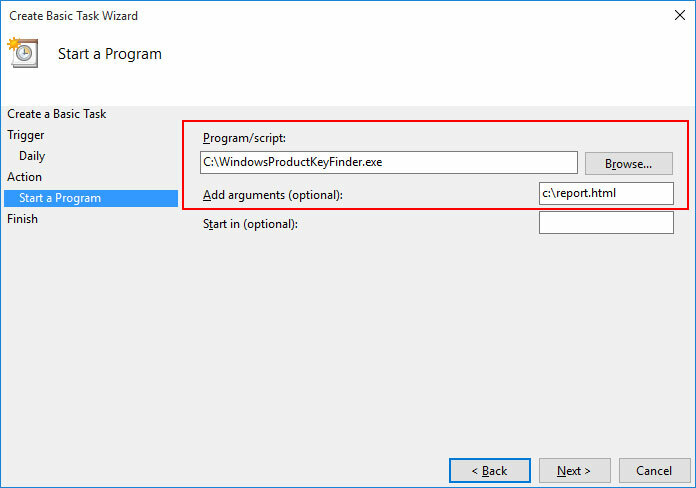 This is the unique feature of XenArmor Windows Product Key Finder. It helps you automatically generate backup database file (SQLite DB) for every license key recovery operation. This will be useful for future references and auditing. By default this feature is disabled. You can enable it by going to Settings & selecting ‘Create Automatic…’ in Automatic Backup section as shown below. Also specify the “Backup Folder Location” where all the backup database files will be created. 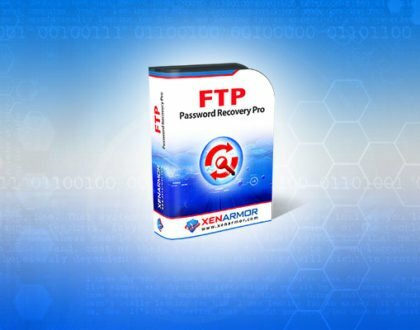 XenArmor Windows Product Key Finder Command-line version can help you to completely automate your License Key Recovery operations daily or periodically. It can generate detailed report which can be used for future auditing or backup purposes. 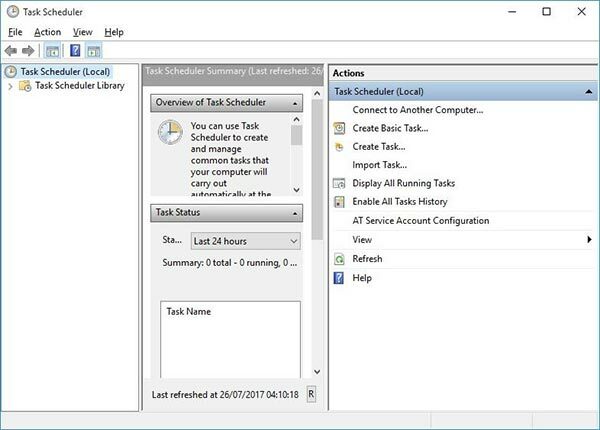 Here are simple steps to automate Windows License Key Recovery using Windows Task Scheduler. 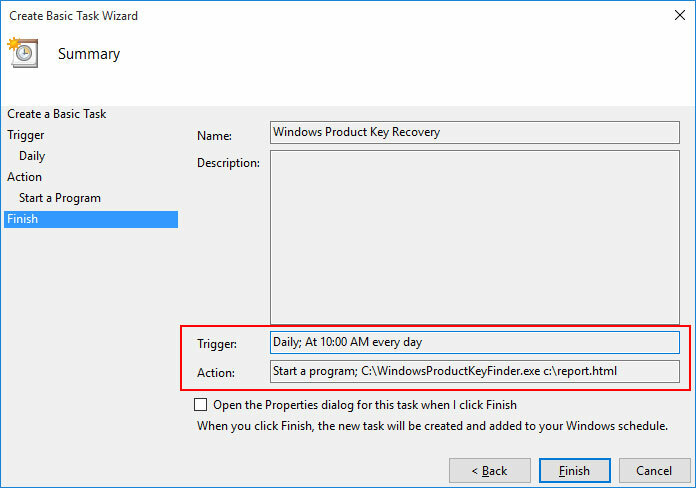 2) On the Basic Task page, enter name as ‘Windows Product Key Recovery’. On next page select ‘Daily or Weekly or Monthly’ with appropriate Time settings as per your need. For more command-line options refer to XenArmor Windows Product Key Finder Command-line Version section. 4) Finally click on Finish button to schedule the automatic Windows License Key Recovery operation.